Setting up a microphone and getting the warm, authentic sound for an acoustic instrument is a tricky business, whether you are doing it for live performance or in the studio. Dynamic microphones are cheap, but are not always very high fidelity, and good condenser microphones are really expensive; both of these options will also pick up every other sound in the room. 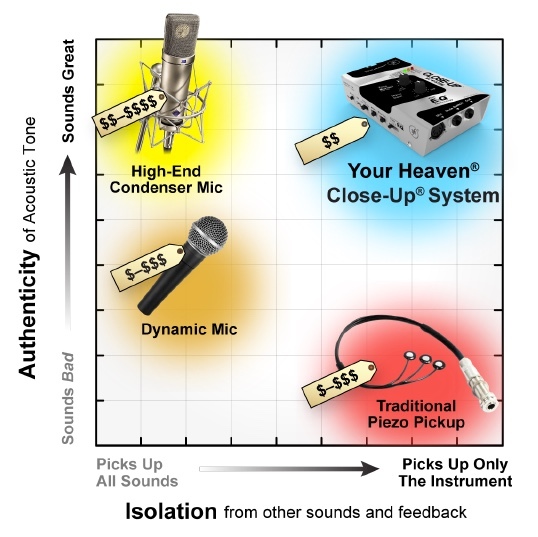 Of course you might have a great pickup system installed in your instrument, but those do not come cheap either. 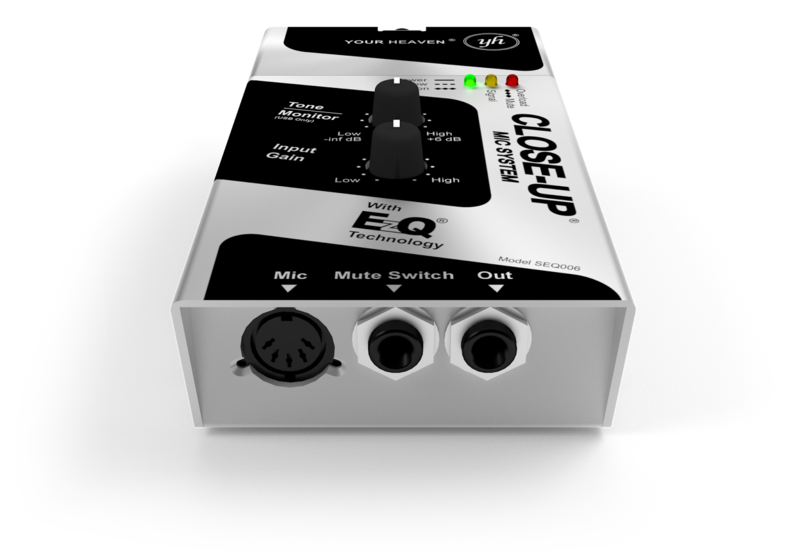 There is another option out there for you to consider: Your Heaven Audio’s CloseUp System. 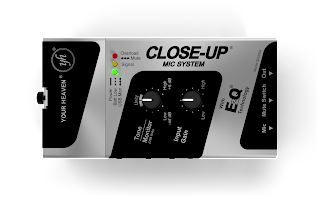 Your Heaven Audio is based in Providence, Rhode Island and its founders studied music and technology at Brown University where they came up with the idea for this project as well as the EzQ Drum System. 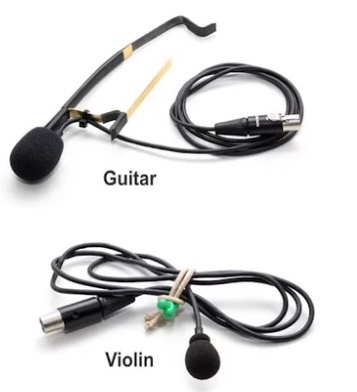 After years of development (including a few new patents) these products are now on the market, with applications for acoustic guitar, and string quartet instruments (viola, violin and cello), with models for other string instruments are on the way (including a double bass model!). 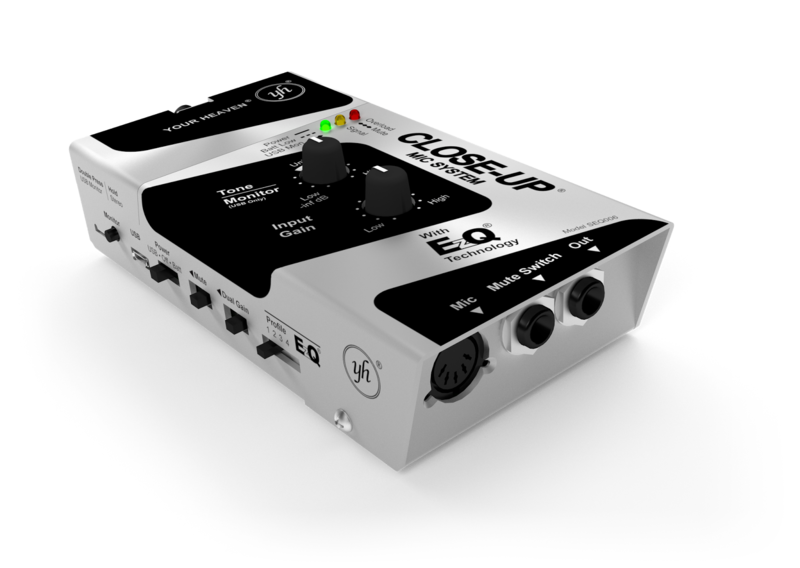 With the CloseUp System kit you will get the EzQ processor (the aluminum box with all of the electronics in it), the transducer, a soundhole cover for acoustic guitars, if you want (or need) to use one, a USB cable, a mute pedal, a 110-volt power adapter, and a TRS to XLR cable, all packaged up neatly in a really nice case. The EzQ processor is the heart and brains of the system, and it is powered via a 9-Volt battery (for approximatley 7 or 8 hours of battery life) or through the USB port. This USB port can also be used for output to a recording device, with the other output being a balanced ¼-inch out. Inputs include the XLR microphone input and a ¼ footswitch jack that can be used to mute the unit. Controls are simple, with just tone and gain knobs. This is a very user-friendly unit! Installation is a breeze, and it can be done with no tools as the microphone clips on to the instrument with no tools needed. The longest part (5-10 mins) of the installation is setting the unit up with your computer to configure it to your specific instrument. It just takes a few minutes of playing the instrument and clicking icons on the screen and you are done. There are four presets in the unit, so you can have up to four of your instruments saved in memory, in case you want to switch the microphone attachment over to another guitar or violin. Your Heaven gave a nice demo of the CloseUp System at the 2017 NAMM show and I came away impressed. They had a mid-level steel string acoustic on hand that was equipped with an LR Baggs undersaddle piezo and preamplifier, and it was set up for an A/B comparison. I was already familiar with the Baggs system, as I have owned and played instruments with it before. 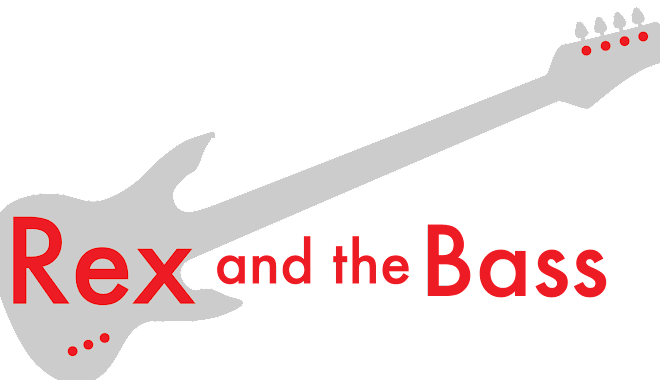 It is a pickup that is “just good enough” with kind of an edgy tone, and of course there was good outside noise isolation due to its design. I was a bit skeptical about how well the CloseUp System would work at the show because the Your Heaven Audio booth was right in the middle of the drum hall, which is a crazy and noisy environment. But, with the soundhole cover in place there was no outside noise coming through the microphone. 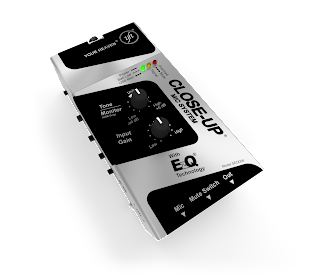 I was even more impressed with the tone of that was produced by the EzQ processor. The sound was very natural, with none of the brittleness that I find with onboard piezo systems, so the inherent warmth of the instrument was allowed to shine through. As an added bonus, because it does not rely on undersaddle transducers, the balance from string to string very even, so I did not have to adjust my playing style to get the guitar to sound right.